SYNOPSIS: Veronica Mars meets The Craft when a teen girl investigates the suspicious deaths of three classmates and accidentally ends up bringing them back to life to form a hilariously unlikely–and unwilling–vigilante girl gang. 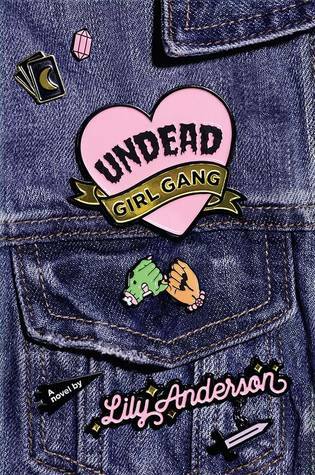 April 26 – The Book’s Buzz – What three historical women I would bring back to be apart of my undead girl gang! I’m glad to hear this was so amazing! I love the idea of bring back the dead to solve a crime (Torchwood, anyone?) and I didnt know about the plus size rep, which is very cool. Thanks for sharing! Ooooh Torchwood! My fiance is always trying to get me to watch that because I LOVE Jack’s character so much, but I don’t watch much TV so it hasn’t happened yet. You’re welcome, Tammy! I really hope you like it if you pick it up! I’m so glad you liked this one. I feel like I’ve been waiting forever for it. Can’t wait until my pre-order comes in. At least it won’t be too much longer! ♥ I hope you love it as much as I did. Thank you so much, boo! ♥ sooooo good! I really wasn’t going to read this one, but you have convinced me to pick it up! Great review! Yaaaay! That’s like the highest form of compliment for me haha! ♥ I hope you enjoy it, and thank you! I added this one to my TBR solely for the cover, but this review has 100% convinced me to pick it up now. Great review, Destiny! I will definitely have to pick this one up after its release next week. Okay, Destiny, this book sounds amazing. You already convinced me to read this asap on Goodreads but oh my lord I loved your review. You made this book sound so so good! Awww yay! ♥ I’m so happy to hear you say that! I definitely did! 😀 I hope you enjoy it if you pick it up! YAAAAY! I think it’s honestly such a fun read so I hope a lot of people will pick it up and hype it! I wasn’t planning on reading this one, but your review has sold me. Adding to my TBR! Awww, yay, Kaleena! That makes me so happy. ♥ I hope you enjoy it! I am so ready for this book and now I’m just so so glad you loved it too! I’m really getting back into YA mysteries and the rep in this book PLUS the Wiccan aspect has left me so intrigued and excited to pick it up. This is a fantastic review!